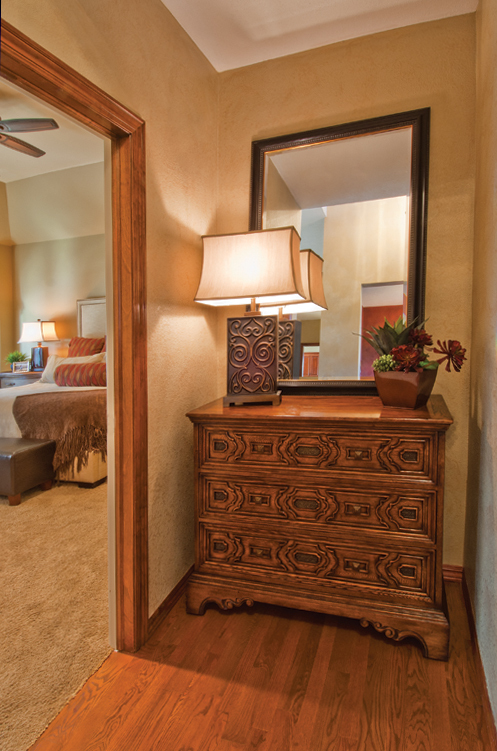 It’s especially important to create a serene atmosphere for bedrooms, starting with the entry niche. Expansive windows, graced with woven grass shades, allow for a seamless relationship with the environment outside and set the tone for this nature-inspired, and aesthetically pleasing retreat. 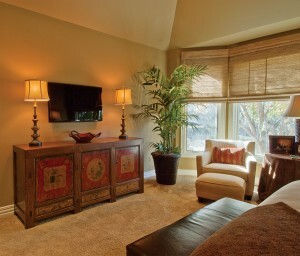 Soothing colors, such as that selected for the coarse linen used to upholster the headboard and for the matching bedspread, are accented with restraint with an interesting antique Asian painted sideboard, red Asian-style glazed ceramic lamps on the rattan side tables, and patterned chenille pillows. Together these distinctive elements create a calm, restorative retreat with a decidedly, sophisticated feel.